Cocaine is a drug used primarily for recreational purposes. However, while some people can use the drug occasionally without any issues, others will go on to develop a crippling addiction that can destroy their life. Abuse of cocaine can significantly increase the risk for addiction as well as a deadly overdose. It is therefore vital to understand more about this illness and the consequences of using cocaine. Cocaine is a drug that is extensively used on the party scene, but as an extremely addictive substance, the potential for abuse is extremely high. As the highs experienced when using this drug can be so powerful but also so short-lived, the temptation to use more is very strong. Many users of cocaine will continue to abuse the drug to prolong the pleasurable effects, but this can make it even harder to resist the craving for more. Furthermore, the fact that most people experience crashing comedowns when the effects wear off make the potential for abuse even higher. Those trying to avoid the unpleasant symptoms associated with the comedown may continue to abuse cocaine until either running out of the drug or collapsing in exhaustion. Cocaine is a Class A, illegal stimulant drug that is popular as a recreational drug. Due to the feelings it produces, it is commonly used in the party scene. The drug is typically available as a white powder and is known as ‘coke’ in most circles. However, another form of the drug is known as ‘crack’ cocaine, known as such because it comes in the form of small rocks or lumps that crack when they burn. Cocaine can make users feel great. They may feel alert and confident, almost to the point of feeling that they can do anything. Unfortunately, this can lead to some people taking unnecessary risks while under the influence of the drug. Many become over-confident and reckless, to the detriment of themselves and/or others. Cocaine use also reduces hunger and it also allows individuals to stay awake for prolonged periods of time, which are probably two of the main reasons it is a popular party drug. Those under the influence of cocaine feel energetic and can dance for hours on end without feeling tired. Cocaine is one of the most addictive illicit drugs available and those who use it tend to experience strong cravings for more. Although not everyone who uses the drug will go on to develop an addiction, others will develop a problem after their very first use. Due to the way in which cocaine affects the pleasure and reward centres of the brain, the desire to use more is very strong and it can occur almost immediately. Furthermore, tolerance to cocaine can develop extremely quickly, meaning that more of the drug is required to achieve the same level of high. The CESAR) in the US states that it is possible to become addicted to crack cocaine after just one use. It also says that while any use of cocaine is risky in terms of addiction, the greatest risk comes with crack cocaine because it is smoked. Compulsive drug use develops more rapidly when a substance is smoked because it reaches the brain more quickly than other forms of administration. This makes crack cocaine much more addictive than regular ‘coke’, which is snorted. The powder version of cocaine is typically placed on a flat surface and divided into lines. Lines are then snorted through the nose. Some users rub the powder along their gum line or will smear it onto the filter of a cigarette before smoking it. Cocaine can also be wrapped in a cigarette paper and rolled up. Users then swallow this ‘bomb’; the term for doing this is ‘parachuting’. Freebase cocaine is one of the least common versions of the drug. It is a specially prepared crystal-like powder that can be smoked. 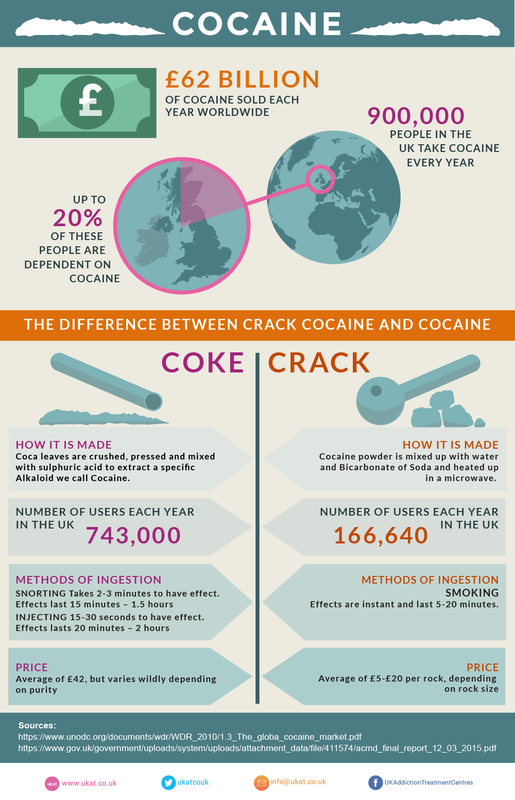 Crack cocaine can also be smoked, which is typically done through a plastic bottle, glass tube, or a pipe. It is possible for cocaine to be injected, and both crack cocaine and the powder version can be heated until they form a liquid. This liquid is then placed in a syringe and injected into a vein. Some people can use cocaine recreationally and never develop an addiction; nonetheless, because of its potential for abuse, it is a highly dangerous drug that commonly causes addiction. Once it enters the body, it goes straight to the brain and causes intense feelings of euphoria and alertness. The high associated with cocaine is more intense the quicker it reaches the brain. Cocaine works by stimulating the brain’s pleasure centres. When it does so, it causes the release of feel-good chemicals known as dopamine. When dopamine is released naturally, it is reabsorbed by the brain shortly afterwards. It tends to be released naturally when you experience something that you associate with pleasure, such as the smell of a food you like to eat, for example. When dopamine is released after cocaine use, it is not reabsorbed by the brain as the drug prevents this from happening. This can lead to dopamine accumulating in the brain, causing the intense feelings of pleasure. It is these euphoric feelings that make the drug so very addictive. With continued use of cocaine, the brain adjusts its response and will begin to release fewer dopamine chemicals in response to using it. This results in the feelings of pleasure diminishing, otherwise known as increased tolerance. If you have built up a tolerance to cocaine, you are going to need higher and higher amounts of the drug each time to achieve the feelings you crave. This can result in repeated use in higher amounts, which then more often than not results in both a physical and psychological dependence. Becoming dependent on cocaine means that your risk of addiction will increase significantly. The risk for cocaine addiction increases among those with certain risk factors. As mentioned already, not everyone who uses the drug will develop an addiction. There are some individuals who can use cocaine occasionally without ever having any major problems, but then there are those who use it just once and go on to develop a full-blown addiction that destroys their life. These risk factors include a family history of addiction, any mental health disorders, and unresolved emotional trauma. Those with more risk factors will have a higher risk for addiction; nevertheless, even having every single risk factor does not mean you are guaranteed to be affected. Cocaine addiction is classed as a compulsive need to use the drug despite knowing that it will have a negative impact on your life. Your behaviour is likely to change dramatically if you have an addiction to cocaine. Symptoms tend to be more psychological or behavioural than physical. You might find that you are using more cocaine than you planned to, or that you use the drug despite promising yourself or others that you would not. This is because you will be unable to resist the pull that the drug has over you. Even when you are convinced that you will be able to stay away from it, you might find it extremely difficult to do when the cravings hit. You might have become preoccupied with cocaine in recent times, and your entire life may now be revolving around it. This might mean that you are spending less time with those you love, and you might have lost interest or motivation for anything else. Your powerful desire for the drug could be causing you to do things that you would never have dreamed of doing before, such as lying to, or stealing from, loved ones. Furthermore, you may be getting increasingly paranoid, which could themselves be leading to feelings of anxiety or aggressive behaviour. This will obviously have a negative impact on your quality of life, but it can also affect those around you too. Your relationships are likely to suffer upon developing an addiction to cocaine. Cocaine was the second most commonly used drug in England and Wales among 16-59-year-olds in 2016/2017, behind cannabis. Around 2.3% of people in this age group admitted to using cocaine, which equated to around 760,000 people. Cocaine was also the second most commonly abused drug behind cannabis in those aged between 16 and 24. Around 297,000 young adults, or 4.8%, admitted to using the drug. The number of individuals using cocaine in 2016/2017 was slightly higher than in 2015/2016, where 2.2% of 16-59-year-olds and 4.4% of 16-24-year olds were using it. 9.6% of those aged between 16 and 59 admitted to having used powder cocaine at some point in their lives. Again, this was second behind cannabis. 61% of powder cocaine users admitted to using the drug around once or twice per year. Men were three times as likely to use powder cocaine than women, with 3.3% of men using the drug compared with 1.3% of women. Powder cocaine use was almost ten times higher among people who had visited a nightclub at least four times in the previous month compared to those who had not visited one in the previous month. 16.1% of those who had visited a nightclub at least four times in the previous month were cocaine users, compared with 1.5% of those who had not visited a nightclub in the previous month. Of those who had visited a bar or pub at least nine times in the previous month, 10% used powder cocaine. Only 0.6% of those who had not visited a bar or pub in the previous month had used the drug. Powder cocaine use in those who are long-term unemployed rose from 0.7% in 2015/2016 to 2.7% in 2016/2017. Tolerance occurs when abusing (whether on purpose or otherwise) most mood-altering substances. When you continue to use a drug such as cocaine, your brain will adjust to it and will change the way in which it responds when you take it. What this means for you is that you are unlikely to get the same feelings of pleasure when you take the drug. An increased tolerance to cocaine often causes users to increase the amount they are using in order to achieve the feelings of pleasure they desire. However, having a tolerance to cocaine does not necessarily mean that you have a dependency. As you continue to use cocaine though, you are likely to find that your brain and body begin to depend on it for normal physiological functioning. You may also experience a range of symptoms whenever the effects of the drug begin to wear off. Dependency on cocaine is characterised by the presence of both physical and psychological symptoms such as fatigue, increased appetite, and an intense craving for the drug. The risk of overdose is extremely high for users of cocaine. The intense cravings experienced by cocaine users often leads them to take the drug in very high doses. But as cocaine is a stimulant drug, taking it in high doses can lead to many of the body’s functions being over-stimulated. 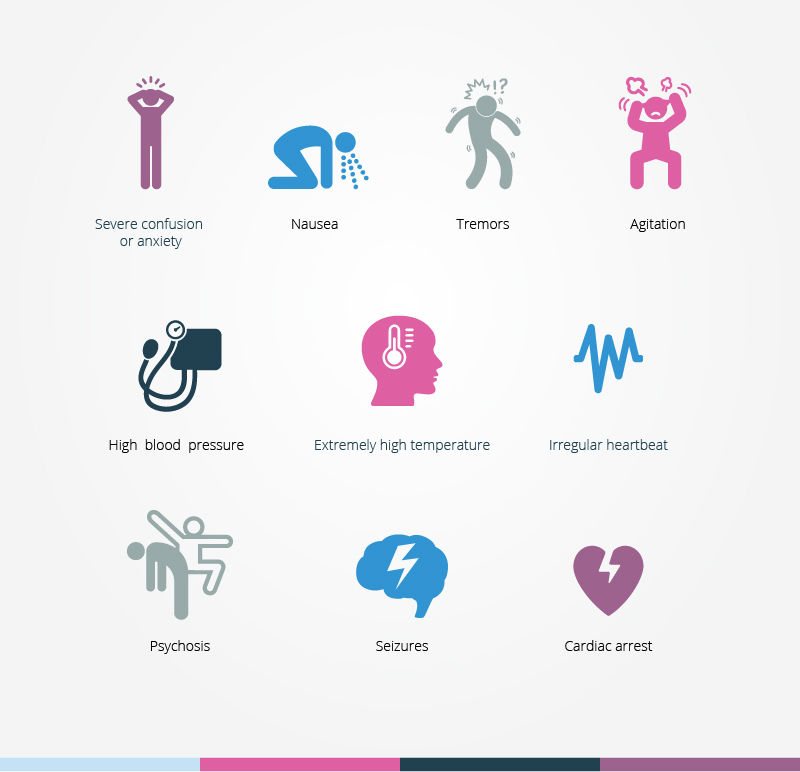 Cocaine causes raised body temperature and can lead to a rapid heartbeat and high blood pressure. When taken in high doses, these effects are amplified and can result in organ failure and death. It is important to be aware that cocaine overdose can occur when it is combined with other substances. It is particularly dangerous to mix cocaine with alcohol, although this is something that most users regularly do. If you have taken a high dose of cocaine or have mixed it with another substance and are experiencing any of the above symptoms, it is vital to seek medical help immediately. The same is true if you are with someone displaying the above symptoms after taking high doses of the drug. Immediate medical attention can greatly improve the chances of recovery from cocaine overdose. If you are with someone you believe is suffering from cocaine overdose, there are a few things you can do while waiting for medical help. Trying to bring down the person’s temperature is important, which can be done by applying a cold compress to his or her body. Knowing what to do in the event of a seizure is also important. Make sure that the individual is in a safe position and that there is nothing around that could cause harm, such as sharp objects. Place the person on his or her side, which should help to keep the airway clear, but do not try to hold the individual down or restrict his or her movements. If you remember, time the length of the seizure so that you can pass this information to the emergency services team when they arrive. Medical staff can treat a cocaine overdose in a number of ways. It is important to run tests to check for the levels of cocaine and other substances in the body. The tests will also help to give staff a better idea of the treatments that will be effective. It may be necessary for a sedative drug such as a benzodiazepine to be administered to reduce agitation and to help prevent the individual from harming him or herself. It will be necessary to reduce the individual’s temperature, and this may be done with an IV saline solution or ice packs. Heart irregularities will also have to be checked to reduce the risk of a heart attack or stroke. If necessary, medication will be administered. Cocaine can seem like an attractive drug for those looking for a way to have fun and enjoy themselves, but as you have probably gathered by now, taking it can lead to disastrous consequences. A tolerance to cocaine can occur very quickly and can result in a physical and psychological dependence. This can in turn progress to addiction. Cocaine users are risking overdose when they take the drug in high doses, but because of the crashing comedown associated with the effects of the drug wearing off, many users will continue to take it to prolong the euphoric effects. Some will mix it with other substances in the hopes of enhancing the effects, but this too can result in devastating consequences. Regular cocaine snorting can cause damage to the septum (the cartilage in the nose that separates the nostrils). Indeed, actress Danniella Westbrook shocked the world when photos of her collapsed septum appeared in the tabloids in 2000, when she was at the height of her fame. The photos highlighted her excessive cocaine use, which led to her checking into rehab. She later admitted that she had first tried cocaine at just fourteen years of age when in a nightclub. Her use of the drug spiralled, and she later estimated that she spent more than £250,000 on drugs, even admitting to using 5 grams of cocaine every day during her first pregnancy. She also acknowledged that she attempted suicide numerous times as she struggled to get through her addiction. Daniella’s story is just one example of the consequences of cocaine use. Users of the drug can suffer both short- and long-term problems. The risk of heart issues, for example, increases dramatically among cocaine users, no matter how much of the drug is used. Those using the drug daily can suffer malnutrition and exhaustion because of the effects that cocaine has on sleep patterns and appetite. And the longer the drug is used, the higher the risk of permanent damage to organs including the liver, lungs, kidney, and brain. In fact, research has shown that cocaine use can speed up ageing of the brain. University of Cambridge neuroscientist Dr Karen Ersche found that the brains of cocaine addicts were losing twice as much brain volume per year as non-drug users. In a report in LiveScience, Dr Ersche said that many middle-aged cocaine addicts were displaying certain signs of ageing, such as cognitive decline. Cocaine use does not just cause problems for health, however. It can have a severe impact on quality of life, with particular emphasis on relationships with family members and friends. Cocaine addicts often become erratic and unpredictable and many will suffer from paranoia, making them aggressive. This obviously has a devastating impact on their family members, who may struggle to cope with the changes in the personality of their loved one. In some instances, relationships can be pushed to breaking point, with many suffering irreversible damage. Cocaine users often mix the drug with other substances hoping to enhance the effects. Nevertheless, doing this is extremely dangerous. Those who use cocaine with sedative drugs can be lulled into thinking that cocaine is not working for them because the effects will be diminished. This can easily lead to them taking higher doses of cocaine to achieve the feelings they desire, not realising that higher levels of the drug can result in a potentially fatal overdose. A similar outcome can result when cocaine is mixed with another stimulant drug. The effects of each substance will be enhanced, and the results are often lethal. Despite warnings about the dangers of illegal drugs such as cocaine, many teenagers will try the drug at least once. There are many reasons teenagers might consider using cocaine. For some it is pure curiosity; they will convince themselves that there is no harm in trying the drug once, and many think that they will never become addicted. Others are pressured into trying the drug by their peers and fear they will be mocked or ridiculed if they refuse. Some use it out of boredom while others are looking for a means of escape from certain life issues. They may be dealing with the effects of a traumatic experience or they might be looking for a way to change how they feel. Whatever the reasons though, the risk for addiction is present for anyone who uses cocaine. It is important to be alert to the signs of drug abuse in your teenage son or daughter. A sudden change in behaviour coupled with a drop in school performance and a change in friends might indicate a problem, especially if you also notice physical symptoms such as a lack of appetite, mood swings, and fatigue. Treatment for cocaine abuse is crucial as it could prevent a full-blown addiction developing. If you have been abusing cocaine, your risk for addiction is extremely high, so acting fast could prevent your life from spiralling out of control. It is important to seek help if you have been abusing cocaine and noticed that you need more of it to achieve the level of satisfaction you desire. Increasing the amount of cocaine that you use can lead you down the path of addiction, so it is best to seek out professional help as soon as possible. You may find that a mutual support group such as Cocaine Anonymous or Narcotics Anonymous can help. These fellowship support groups operate across the UK and are the perfect place to go for support for cocaine abuse. You can also consult your doctor for information on other options that will help you to get your life back on track. You should know that cocaine addiction is notoriously difficult to treat due to the intense cravings that accompany it. In a mutual support group, you will get advice on how to deal with these cravings. It is also a good idea to find other ways of occupying your time. Finding new interests such as hobbies can give you some focus and a place to direct your attention should you find yourself faced with triggers and temptations. It is also imperative to avoid people and places that you associate with cocaine use. Doing this should help you to quit the drug. If you already have a cocaine addiction, it is almost certain that you will need professional help to get better. As already mentioned, it can be difficult to break the cycle of cocaine abuse because of the intense cravings you are likely to experience when you quit. A cocaine addiction is typically treated with a detox and rehabilitation programme. Detox is required to help you quit the drug and is best completed in a dedicated detox facility. Within such a facility, your symptoms can be effectively managed to help minimise the impact. You will also find it easier to abstain from cocaine when detoxing in a secure clinic, where you have the support of fully trained staff members at all times. Trying to quit cocaine at home will be a challenge for most, and many people will return to the drug when cravings return, which often happens after the first week. Therapy is often used during the detox process as soon as you are able to benefit from it, which is another reason to detox in a dedicated centre. It can then continue during rehabilitation, with talking therapies such as cognitive behavioural therapy (CBT) being particularly useful. CBT helps you to learn more about your addiction and the negative thoughts that are driving your behaviour. It is also used to help you change the way you react to negative thoughts. During treatment for cocaine addiction, you are likely to have a variety of treatments that will also include holistic therapies such as meditation and mindfulness. These approaches can help to improve your overall wellbeing and can be used to curb cravings. At the moment, no medications are approved for use to ease the cocaine detox, but there are some that can relieve the symptoms experienced during the process. Because your brain has adjusted to the cocaine use, it may be the case that it struggles with the production of neurotransmitters by itself. Medications can help to calm the central nervous system as your brain learns to function without cocaine. Gabapentin can help to promote the release of the GABA neurotransmitter, which is required to relieve symptoms of anxiety. GABA is the brain’s natural calming chemical. You might also be struggling with fatigue and drowsiness during withdrawal from cocaine. If this is the case, your doctor might prescribe a medication called modafinil, which can help to encourage the production of dopamine and help promote healthy sleeping patterns. Medication is typically used in conjunction with therapy to provide a whole person approach to cocaine recovery. To overcome an addiction to cocaine, you will first have to quit using the drug, the process you now know is as withdrawal, or detoxification. When you quit cocaine, you are likely to experience a deep depression, so this coupled with intense cravings for the drug might mean that a return to drug use might seem like a good idea to you at the time. It is for this reason that cocaine detox is most effective when it takes place in a dedicated detox facility. To overcome the withdrawal process, you will need around-the-clock care and support. Once you have completed detox, treatment for the underlying issues associated with the illness can begin. This is known as rehabilitation and it usually takes place on an outpatient or inpatient basis here in the UK. Rehab programmes are provided by many different organisations, including private clinics, charity organisations, and the NHS. For information on your options, talk to your doctor or use an online information database that will have details of the various programmes in your area. You can also contact us here at UKAT for information on private residential programmes. Cocaine addiction is difficult to treat, but talking therapies tend to work well. Cognitive behavioural therapy can help you to learn more about why you became addicted in the first place and help you to recognise the negative thoughts that drive your behaviour. Incentive therapy such as contingency management is also useful. This type of therapy provides rewards for good behaviour and consequences for bad behaviour. Treatments used for cocaine addiction tend to be based on the needs of the individual. Every person will be given a bespoke treatment plan that is expected to work effectively for them. However, for treatment to work, you must be fully committed to the programme and have a fervent desire to get clean and stay clean. Cocaine has a profound effect on the brain. It causes a surge of pleasure when it is taken because it encourages the production of the brain’s natural feel-good chemical dopamine. Dopamine is normally released by the brain naturally in response to possible rewards such as the smell or sight of nice food. The dopamine that is produced naturally is then absorbed back by the brain. The difference with cocaine is that the feel-good chemicals released when the drug is taken is not reabsorbed back into the brain. This causes it to build up and induces intense feelings of euphoria. Cocaine use can lead to many health problems. In the short term it can affect sleep patterns and appetite, but if use of the drug continues, it can result in insomnia, exhaustion, and malnutrition. There is also an increased risk of heart problems due to the stimulant effects of the drug while many other organs can also suffer long-term damage including the lungs, kidneys, and liver. 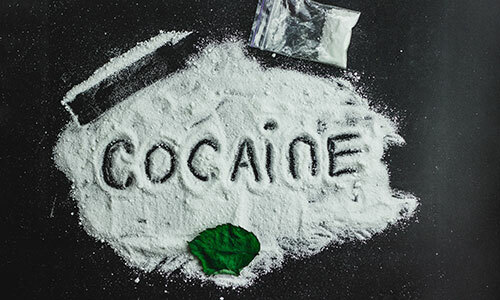 As well as the impact on physical health, continued regular abuse of cocaine can cause mental health problems such as paranoia, schizophrenia, and psychosis. Cocaine users regularly use other substances to enhance the effects of each or to take the edge off the jitteriness and agitation that can occur with cocaine use. Alcohol and other sedative drugs might be used, which can then lead to cross addiction, where the user is struggling with a dependence on both substances. Treatment for cross addiction is much more complex and usually requires a longer rehab programme as both illnesses need to be treated at the same time. During detox, each substance must be withdrawn completely to prevent complications with withdrawal. What to do when you recognise signs of addiction? 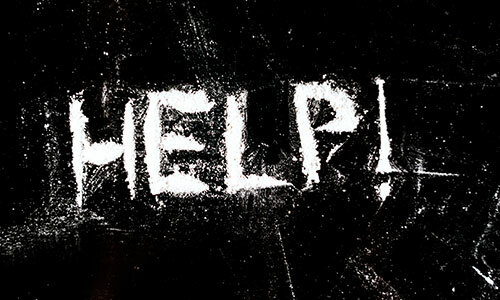 If you believe that you may have developed an addiction to cocaine, it is important that you seek help immediately. Addiction is a progressive illness and doing nothing at this point could cause your situation to deteriorate further. For advice on how to get your life back under control, speak to your doctor who can then refer you to a local drug treatment service. You may also find the information you need via an online information database. You can then self-refer if you prefer. 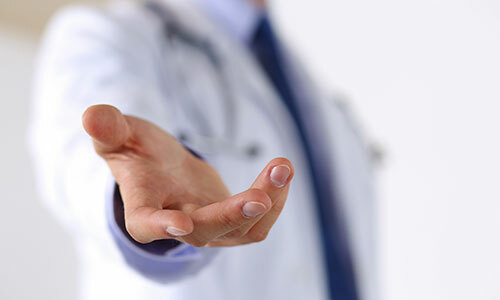 If you have questions regarding your situation and would like answers before speaking to a doctor, please do not hesitate to get in touch with us here at UKAT. We would be happy to assist by providing a comprehensive assessment of your situation. This will give you a clearer picture of what you are dealing with. We can also provide information about the programmes that are available through our many clinics if you are interested in inpatient care. It is hard to come to terms with the fact that you may have developed an addiction to cocaine, but it is important to look honestly at your use of the drug. An addiction is characterised by a compulsive need for a substance and a failure to stop using it even when it is interfering with your ability to live a normal life. If you have been abusing cocaine despite it causing harm to yourself or others, it may be the case that you have an addiction. If you have promised yourself or the people you love that you would stop using cocaine but were unable to resist the cravings, it is time to seek help. Knowing when someone needs help? Just as it is important to be able to recognise the signs of addiction in yourself, it is equally important to be alert to the signs in someone you love. You may notice changes in the behaviour of a loved one if an addiction to cocaine becomes an issue. Addiction often results in individuals losing interest in those around them and they may also lose all motivation to do things that they once enjoyed. If your loved one has started to act strangely and you suspect that cocaine abuse may be to blame, it is important to address the issue head on. Does cocaine have any legitimate medical uses? Although a highly addictive drug, there are some medical uses for cocaine. Topical cocaine such as TAC (tetracaine, adrenaline and cocaine) was developed in 1980 and is used as a topical anaesthetic for paediatric use. It can be used as a local anaesthetic in paediatric patients being treated for skin lacerations. Cocaine can also be used for certain eye and nasal surgeries. Although still occasionally used in medicine, cocaine is used less frequently now because of its addictive properties and because other alternative substances have subsequently been developed. Are there dangerous hidden ingredients in cocaine? Cocaine sold on the streets is rarely pure and unscrupulous dealers often mix it with other substances to maximise their profits. Unfortunately, some cocaine batches can be mixed with dangerous ingredients. For example, a drug that is used for the treatment of livestock that have parasitic worms, known as levamisole, may be mixed with cocaine in order to add weight to the drug. When used in humans, levamisole attacks white blood cells and can weaken the immune system. This can lead to infections, some of which could end up being deadly. Cocaine can also be combined with anaesthetics such as lidocaine and benzocaine. But when these anaesthetics are mixed with cocaine, complications often arise. The lungs, heart and brain can be particularly affected.